An Aerospace company needed a gantry machine capable of high-speed machining of carbon fiber reinforced plastic (CFRP) used on aircraft wings and fuselage. It was critical that the machining process did not cause high mechanical stress or impacts on the material, which could produce separation of fiber layers. 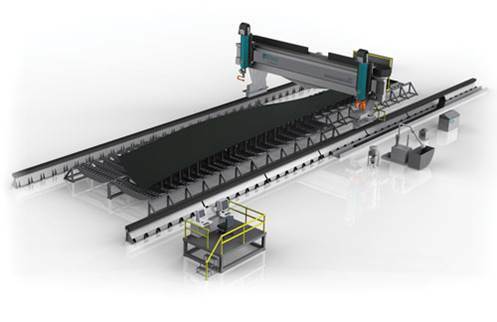 The abrasive waterjet machine was chosen because it offered several key benefits over traditional machining methods, including: reduced stresses and impact on material, no dust from machining, no heat build-up and no rigid part clamping needed. A method of driving the long gantry was needed that would provide precision positioning and repeatability. To meet the customer's accuracy needs, ATLANTA offered an Ultra-Precise Rack & Pinion Drive, consisting of a helical hardened & ground (HPR) rack and split-pinion, driven by a reduced backlash Servo-Worm Reducer. The modular helical racks were precisely mounted end-to-end to achieve the desired travel length and the split-pinion was used to remove all of the backlash at the rack & pinion tooth flanks along the full travel length. The split-pinion's preload was fully adjustable and set to match the machine's running parameters. The split-pinion shaft was mounted into the hollow bore of the High-Performance (HP) Servo-Worm Reducer, which provided a rigid support with minimal radial deflection. The reducer also provided high dynamic motion and torsional rigidity while driving the load, and allowed for direct mounting and inertia matching of the servo motor. The sides of the gantry were timed together electronically in a master/slave setup for smooth operation and motion of the gantry. As a result, the gantry machine was able to achieve very accurate results in the finished parts, without damage to the sensitive material.